The Hermitage Museum in St. Petersburg, Russia is one of the largest, oldest, and most important art galleries in the world. It is the highlight of any trip to Russia - and indeed the Baltic region. The museum's vast holdings are housed in six buildings, including the former winter palace of the Russian Tsars (pictured above). The Hermitage's permanent collection spans centuries, and includes works by Italian masters, French Impressionists, and the fabled Faberge eggs. The Hermitage collection was begun in 1764 by Russian empress, Catherine the Great with 250 European paintings. She commissioned her ambassadors to scour their posts for potential additions to the collection and it grew rapidly. The hermitage was, however, for Catherine's private enjoyment and very few were permitted to view the works. The Hermitage remained the home of the Tsars - and the collection private - until the revolution of 1917. Since then the galleries have been open to the public and the collection expanded, through purchases and by nationalization of private collections during the Soviet regime. The Hermitage collection includes over three million works, and includes examples from all periods from the Stone Age to the 21st century. Highlights of the museum include works by Rembrandt, the largest collection of his works in the world; ancient gold artifacts, including a substantial amount of the gold uncovered of ancient Troy by 19th century archeologist Heinrich Schliemann; a large 20th century modern art collection; and the jewelry and jeweled eggs created by Peter Carl Faberge. As with the Louvre and the Metropolitan Museum of Art, it is impossible to see everything in the Hermitage Museum in one day. It is best to limit yourself to one period or one building. It is advisable to arrive early to avoid the crowds from tours and cruise ships. The Hermitage is open Tuesday through Saturday from 1030am to 6pm, and on Sunday from 10:30am to 5pm. 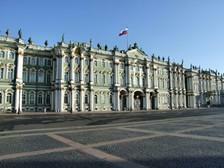 The Winter Palace carries a separate admission and closes an hour earlier than the main museum. The museum is closed on Mondays and holidays. Admission is 350 rubles for the main museum and 200 rubles for the Winter Palace. Discounts are offered for groups and students. In addition, admission is free for all on the first Thursday of each month. The Summer Palace - The 14-room, Baroque, summer house of Tsar Peter the Great is a well-preserved example of the Imperial style. The Bridges - St. Petersburg has over 300 bridges, representing a variety of design styles, crossing the Neva River and its tributaries. In fact, the city is often referred to as the "Venice of the North."